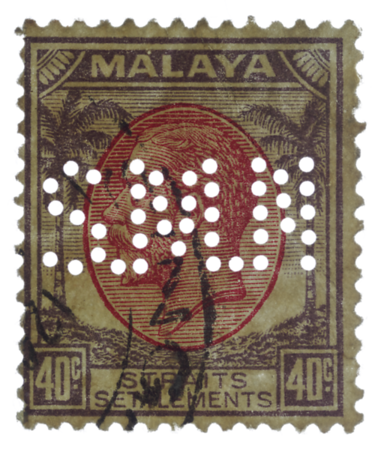 Occasionally, one encounters a piquant juxtaposition of the agrarian and the industrial: the woodcut design of the coconut definitive, perforated with machined holes reminiscent of the punch cards in early computers, as if heralding the dawn of the digital age. 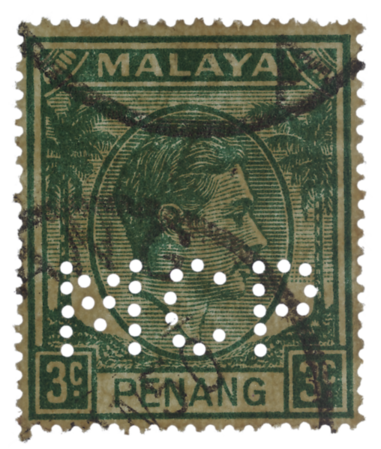 The so-called perfin, standing for perforated initials or perforated insignia, is in fact a security marking used by companies and government departments to deter unauthorised use of their stamps. 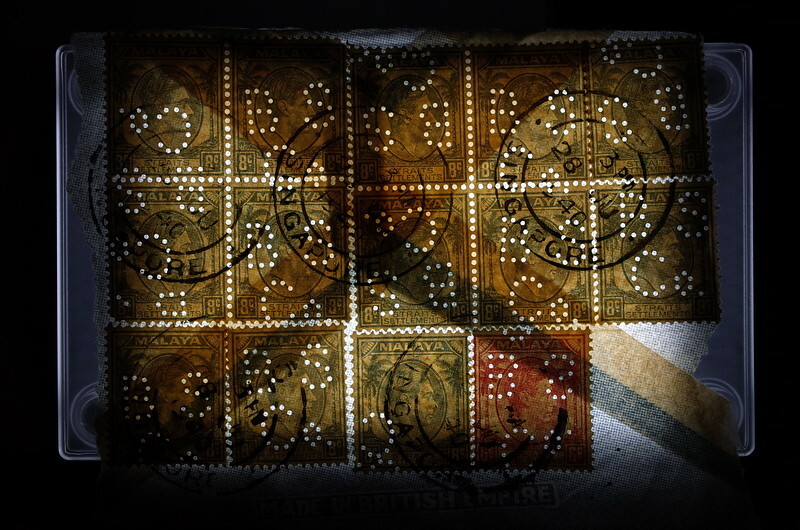 They were originally known as spifs for stamps perforated with initials of firms (Alderfer 1999). Stamps were legal tender and could be misused by greedy employees to buy goods like bread, cheese and ale (Alderfer 1999). 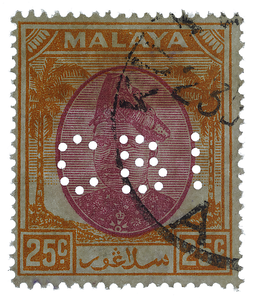 Compared with true dot-matrix print, perfin letters have fewer dots and a more primeval character, as the latter's holes do not conform to a grid. They imbue the coconut definitive with a touch of elegance and add another dimension to its typographic diversity. In the companies they represent, they embody the globalism and cosmopolitanism of Malaya. 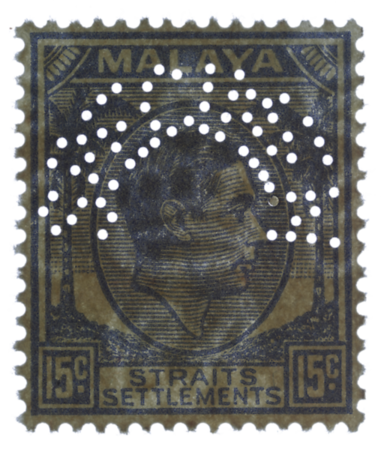 Samuel type d21 perforator (1940) of De La Rue (Cockburn 2010), which was individually applied to stamps (Freeland 2010). 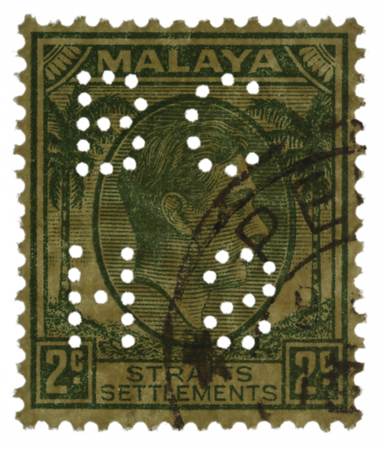 The word specimen marks a stamp provided to postmasters and postal administrations as a reference sample, and invalidates them against postal use. Perfins have a drawback here: the numerous holes may coincide with important design or print details. A nicely centered strike of the multiple script ca watermark is visible in the above. Boustead & Co., an asset management and corporate finance company established in Singapore in 1828 that has grown from strength to strength with the country to this day. 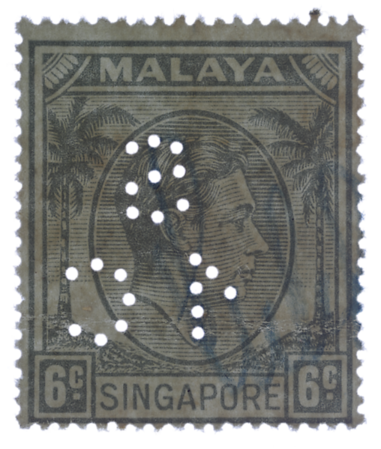 Left, a die used by the Singapore office (Turnbull 2017); right, a larger, scruffier die used by the Penang office (Turnbull 2017). 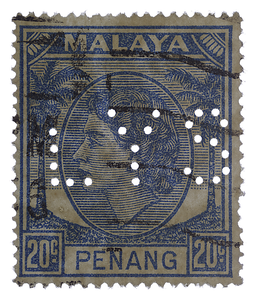 A perfinned stamp is viewed less favourably on the market if the perfin cuts into the sides, but the author sees beauty in the human touch of perfin production. The Stoomvaart Maatschappij Nederland (Netherlands Steamship Company) had a motto with the same initials: Semper Mare Navigandum (“Always Sail the Seas"). It later merged into Nedlloyd, which in turn became part of the world's largest container shipping line, Maersk Line. The perfin's holes are large even for the oversized font, distorting some of the letters and making it hard to read. 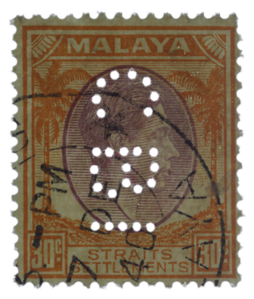 Stamps carrying the purported Borsumij perfin glow like a 15th-century perforated Egyptian mosque lamp. Some of the perfins are upright, some are inverted, and the one at bottom right is inverted and reversed. 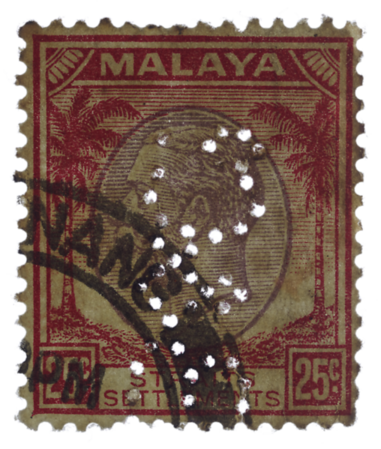 Only one is a perfect hit, the second from left in the bottom row, and it shows that it is the perfect size for the small-format definitives of the British Empire. The perforator appears to have been single-set and hand-held. 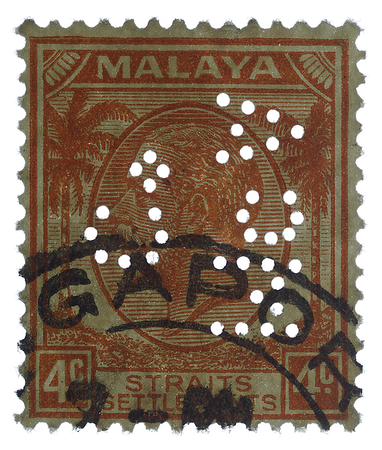 The two 2×2 blocks of unseparated stamps (upper left and upper centre) appear to have been punched one stamp at a time instead of being folded and punched all at once. 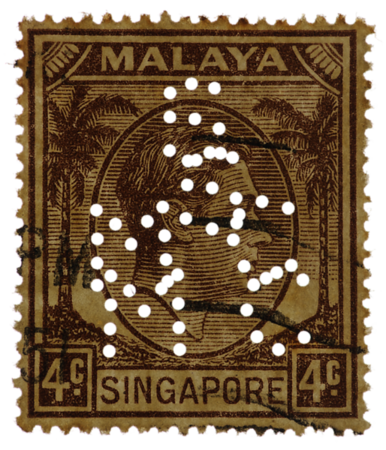 It looks as if the two stamps in the right-hand column of a given block were punched first, upright, and the block rotated in the hand to punch the remaining two stamps, which would explain why their perfins are upside down. This perfin is thought to have belonged to the powerful Borneo-Sumatra Trading Company (Turnbull 2017), known in its home language as Borneo-Sumatra Handel Maatschappij or Borsumij. Its headquarters were at The Hague, and branches were scattered throughout the Netherlands East Indies (Grove & Sugiyama 2013). 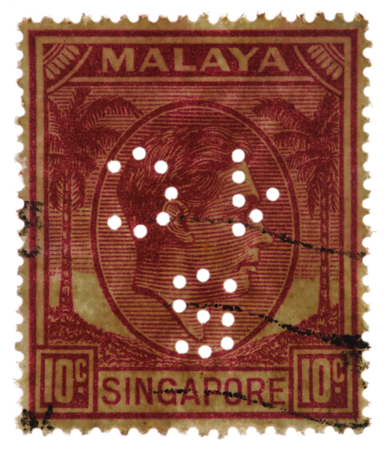 Singapore was its only branch in Malaya. The office was presumably housed in the Borsumij Building on 41 Robinson Road. An advertisement of office space boasted of an electric lift and “all modern conveniences”. Borsumij traded widely on steamships and dealt extensively with Chinese merchants (Campo 2002). It monopolized commodities in the region, from coal and rubber to tobacco to fish and forest products (Campo 2002, Grove & Sugiyama 2013). Using smaller vessels, its agents ventured as far as the upper reaches of remote Bornean rivers. 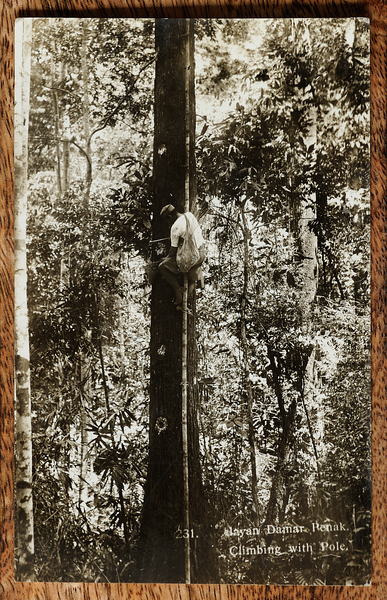 Damar penak, a resin, was one of the Malayan forest products traded by Borsumij. 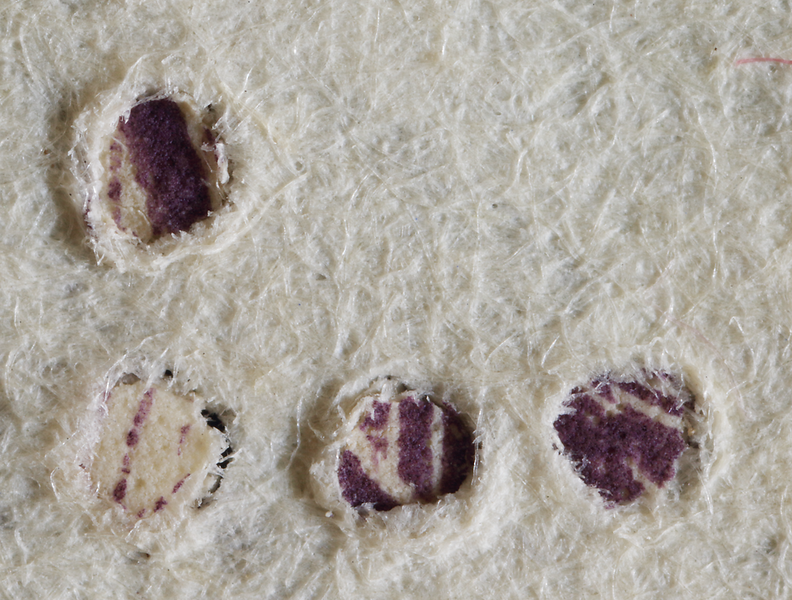 It was tapped by minimalist native climbers from the tree Balanocarpus heimii (family Dipterocarpaceae) for use as varnish (Meinwald & Messer 1990). Damar from other species of dipterocarp was used for various purposes like sealant for burial jars and fuel for lamps (Meinwald & Messer 1990, Mahdi 2007). Different hole sizes from the Asiatic Petroleum Co. Competing British and Dutch petroleum companies, Shell Transport & Trading Company and Royal Dutch Petroleum Company, set up this joint venture in 1903 to develop markets in the Far East. 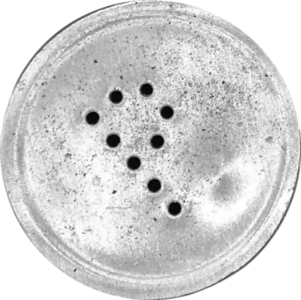 The upside-down perfin includes what could be a small control hole or code hole in the lower left corner denoting a specific machine, although control holes are usually of the same type as the regular holes. Chartered Bank of India, Australia and China, which was closely allied with British colonial trade in Asia. It merged with the Standard Bank in Africa in 1969 to become Standard Chartered with headquarters in London. The perfin comes in three different sizes, from (left–right) Singapore, Penang and Kuala Lumpur. 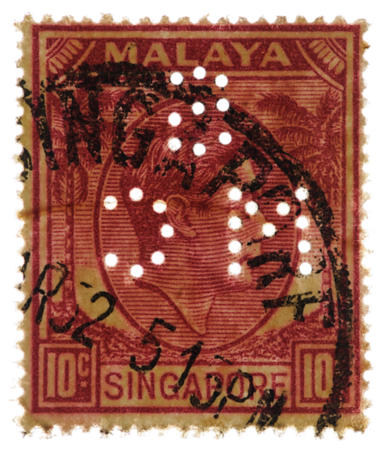 The Singapore version has stops and in this example exhibits a beautiful transitional phase between embossing and perfin, showing “crescent moons" of partially punched-out circules (new English word coined by author in 2017) of paper, and fiscally cancelled with the rubber stamp of the same company. 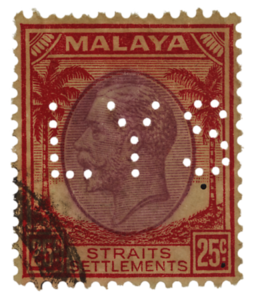 The Hongkong and Shanghai Banking Corporation (hsbc) was involved in the management of colonial government accounts in Penang and Singapore. See McClaren (2004) for more background on the bank and its perfin. There are eight possible orientations of the letters, arising from the common practice of folding blocks of stamps to be punched simultaneously. Part of the h in an hsbc perfin. Stamps perfinned in folded blocks sometimes leave their punched-out bits in other stamps facing the opposite way when the block is separated. The Yokohama Specie Bank had numerous branches in Japan, London, New York, China, India and southeast Asia and was a foreign exchange heavyweight (Yamazaki 1992). Perhaps because of that, it was the paymaster of the Imperial Japanese Army in World War II and became the Bank of Tokyo in 1946. 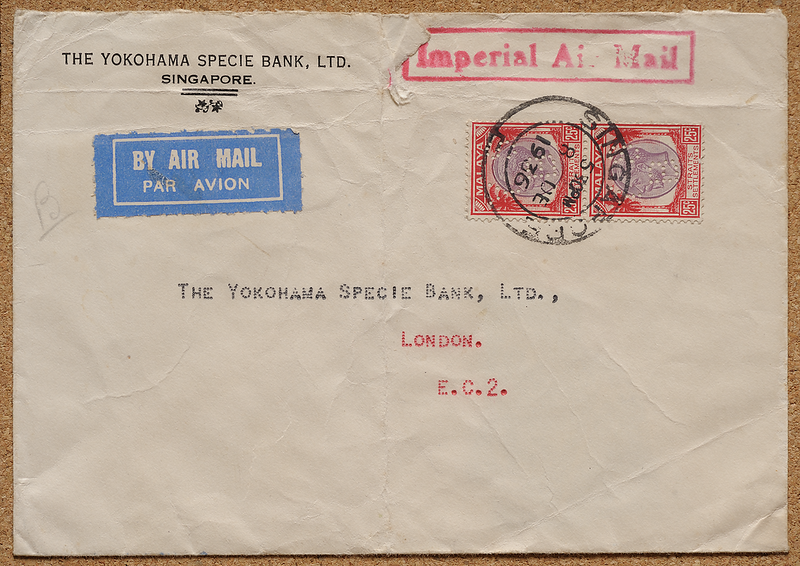 Ysb perfins on cover, travelling between the Singapore and London branches of the Japanese bank in 1936. Relationships would be complicated by war five years later. 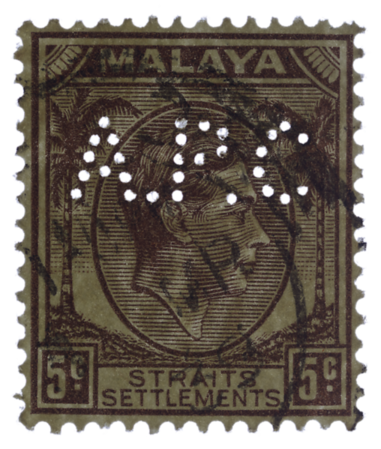 The address lines appear to have been made by a typewriter, but a very unusual one with perfin-like dot type and small caps. 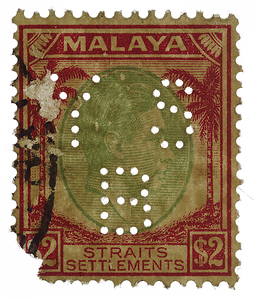 The machine had the typical heavy punctuation marks and a black-and-red ink ribbon. The words bear the characteristics of typewritten text. Multiple instances of a given letter seem to have come from the same type element with the same baseline shift. The letter a is always bottom-heavy, as would have been produced by a mechanical type element always hitting the paper at a slight angle. The relatively large vertical shifts of the uppercase capitals indicate the use of a mechanical shift key. 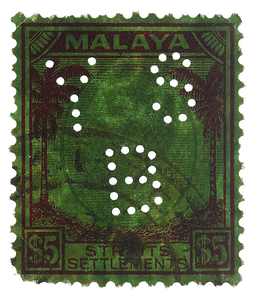 The author speculates that the dot type was meant to save ink and maximize reuse of the ink ribbon. Imperial Airways was set up to improve communications with the colonies in the Far East and other regions. It later became part of British Airways. 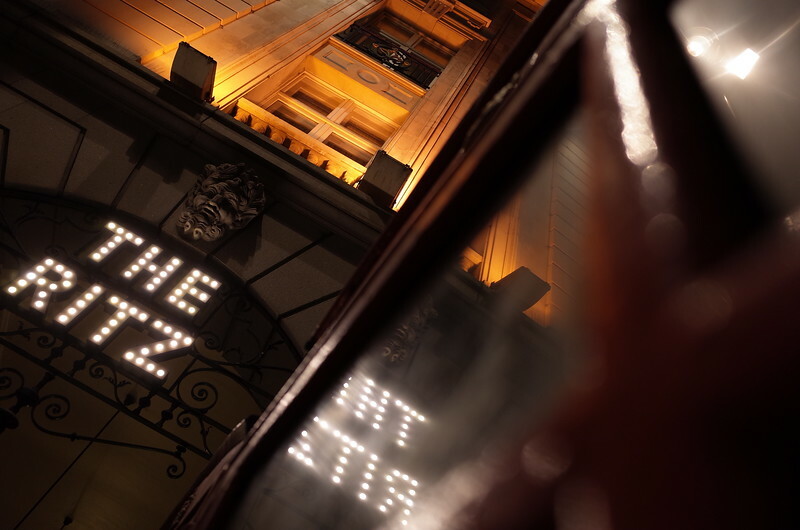 Perfin-style lettering is sometimes used to project a glitzy image, like the façade of the The Ritz in London. The perceived font size and weight can be tuned by changing the number of dots in a letter. Photo: Lin Yangchen for Agence Coconut-Presse. McAlister & Company started in 1857 as a pearl auctioneer, but expanded into an agent for everything: wine, cement, pharmaceuticals, fire engines, life insurance. It was acquired in 1971 by and lives on as part of United Engineers Limited. Perfin of Law Yew Swee & Co., dealer in a wide variety of goods from wines and tobacco to fashion to hardware, construction materials and stationery. 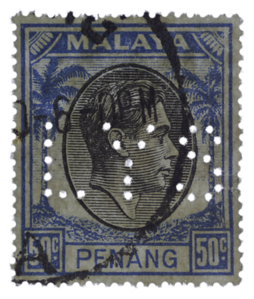 Law (1881–1954), born in Penang, set up his business after several years as a civil servant in Kuala Lumpur, which now has a street named after him. These stamps, spanning the reigns of three monarchs, would have been privy to the day-to-day gossip of the company, perhaps from the vantage point of a secretary's drawer. The perfin on the QEII stamp is missing a hole. Royal Dutch Shell, one of the largest oil and gas companies in the world. In 1945, Shell's Danish headquarters in Copenhagen, at the time being used by the Gestapo, was bombed by Mosquitoes from the Royal Air Force. In the 1950s Shell was the first company to use a computer in the Netherlands. 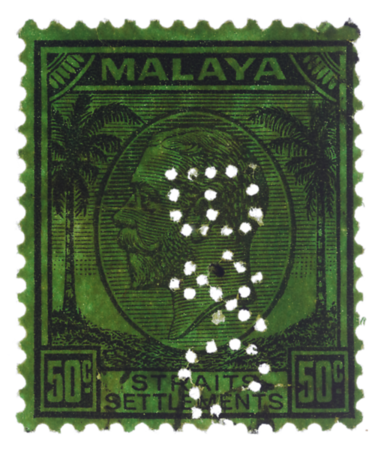 Even today, multinational companies have a hard time negotiating the nooks and crannies of the Malay archipelago. 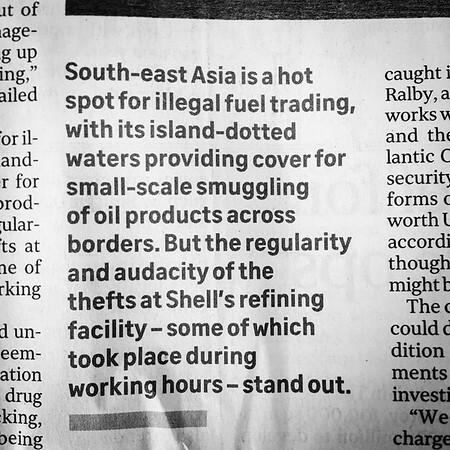 In 2018 Reuters explosively revealed that $150,000,000 of oil had been stolen from Shell over the previous four years. The story was reproduced on the Business cover page of The Straits Times (above). Just imagine what it was like during BMA. Municipal Commissioners, Penang. 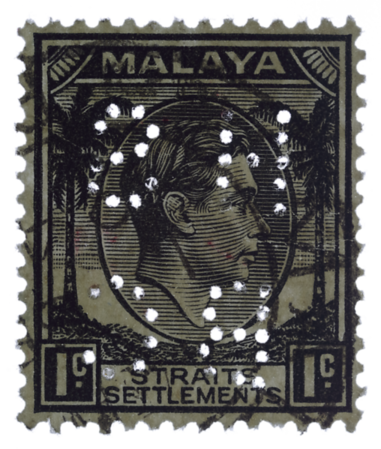 It was in use throughout the Malayan Emergency, despite matching the acronym of the Malayan Communist Party. 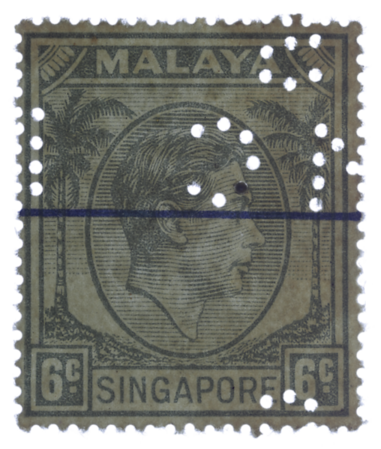 Pre-war perfin of the Singapore Municipal Commissioners (smc), who oversaw domestic affairs like water, gas, electricity and nightsoil removal. 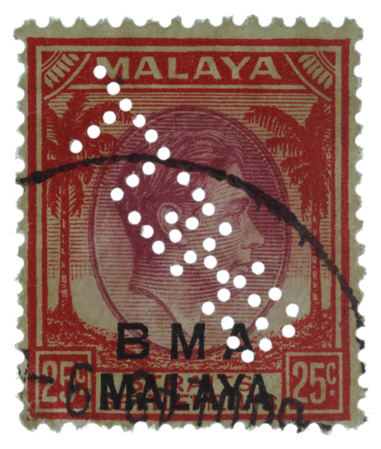 Post-war smc perfin (1947–1974), with a defective singaporf datestamp. The perfin machine, made by reputed firm Joseph Sloper & Co. in London in a setting of four dies in a row, was rediscovered at a flea market by Yong (2011). 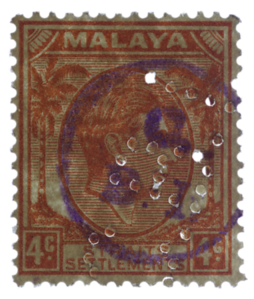 In fact, Sloper was the pioneer of postage stamp perfins; his proposal to so protect merchants from the theft of their stamps was approved by the General Post Office in Britain in 1868. The machine has a large hinged lever that when pressed downwards drives four sets of pins into a horizontal strip of four stamps. Two separate strikes on plain paper (above) show a horizontal periodicity of 2.05cm, which corresponds quite precisely with the width of the coconut definitive. Even more interesting, however, is what actually happens when it is being operated (Lin & Yong 2017). 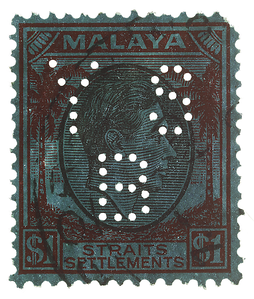 The lower row of perfins (above) is the output when one depresses the lever fully, with complete letters throughout except for the chipped M on the extreme right. 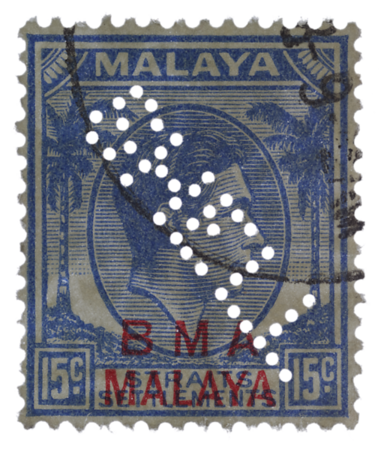 The upper set, punched with less force and incomplete travel of the lever, displays additional flaws in truncated m's as well as holes with incomplete removal of paper. This demonstrates that the human hand can spawn striking variations and flaws from a single machine and even a single set of pins. Truncated m in reversed and inverted forms. The author has also seen an example with only one stem of the m remaining, making the perfin look like sic. Mis-estimation was common with the hand-operated machines in the realm of perfin production. Double perfins are relatively rare. Spiral staircase for nightsoil collection in the old days. 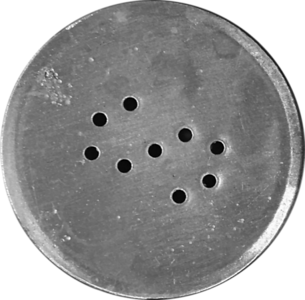 The author was chowing down on a mixed grill at Bosphorus Kebabs in London's South Kensington district when he noticed that the salt and pepper shakers had the same number and arrangement of holes as the letters in the smc and apc perfins. Perfin of the Singapore Improvement Trust, set up in 1927 to clear slums and improve sanitation. 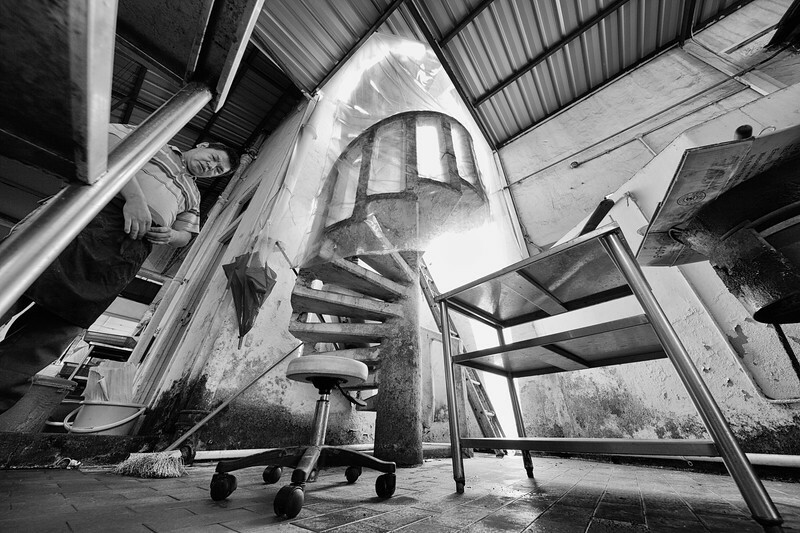 It oversaw the construction of Singapore's very first flats to house the growing population. Blocks built in four architectural styles remain standing at Dakota Crescent. The trust was superseded by the Housing Development Board in 1960. On the stamp is the your vote is secret handstamp made for the 1955 general election. It features Latin, Tamil, Chinese and Jawi scripts representing the four main races in the local community that came to live together in the new sit flats. The People’s Action Party was only a year old and Lee Kuan Yew was in the opposition. See Dewey (1971), Hall (1986, 1987), Giffen (1989, with corrections in The Perfin Society Bulletin (1991) 254:9–10), Lavender (2002), Peters (2008a), Cockburn (2016c), Turnbull (2017) and Michel Houde's online database for perfins of Malaya, and Hill (2015) for a review of perfin production methods. 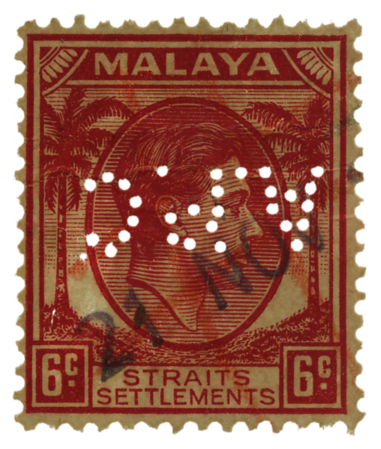 Documentation of Malaya perfins remains incomplete while primary sources are eroding with the passage of time. 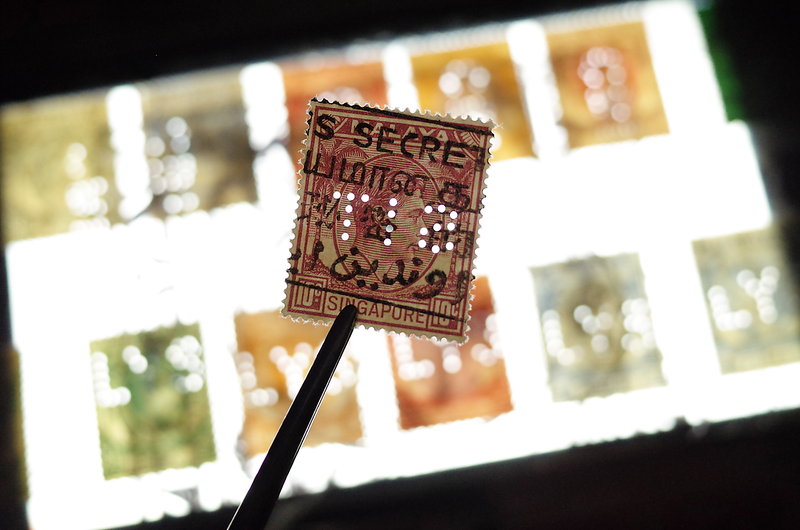 Forgeries are by no means unknown in the perfin world—some have even been made using the original machines—and it is impossible to be sure without a complete reference of dies and settings. Moreover, it is not clear whether the pins in perfin machines could have been bent or lost with wear and tear, further complicating perfin taxonomy.